Statistical Distribution Fitting for Excel allows to easily and quickly select the probability distribution which best fits to data, reducing analysis times by 70-95% over manual methods. It includes numerous features designed to save time, prevent analysis errors, and help make better business decisions. 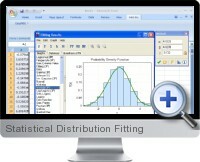 The key feature of Statistical Distribution Fitting for Excel is the ability to automatically fit over 40 distributions to sample data and select the best model (advanced users can apply the manual fitting feature). The goodness of fit tests (Kolmogorov-Smirnov, Anderson-Darling, Chi-Squared) and a variety of graphs (probability density, cumulative probability, survival, hazard, P-P plot, Q-Q plot etc.) help to compare the fitted distributions and ensure the most valid model is selected. The integrated StatAssist tool can also be applied to make business decisions based on the analysis results. Statistical Distribution Fitting for Excel allows performing worksheet data analysis and simulation, create advanced worksheet models, and develop VBA applications dealing with uncertainty to tailor specific needs. Statistical Distribution Fitting for Excel supported distributions: Bernoulli, Beta, Binomial, Cauchy (Lorentz), Chi-Squared, Erlang, Error Function, Exponential, F Distribution, Fatigue Life (Birnbaum-Saunders), Frechet, Gamma, Generalized Extreme Value (GEV), Generalized Logistic, Generalized Pareto, Geometric, Gumbel, Hypergeometric, Inverse Gaussian, Johnson SB, Johnson SU, Laplace (Double Exponential), Logarithmic, Logistic, Log-normal, Negative Binomial, Normal, Pareto, Pert, Poisson, Power Function, Rayleigh, Student's t, Triangular, Uniform, Wakeby, Weibull.